Home » What's happening? » It’s a kind of magic: First ArcTrain student successfully defends his PhD thesis! It’s a kind of magic: First ArcTrain student successfully defends his PhD thesis! Tuesday, March 28th 2017, 11:20 am. University of Bremen, building ‘NW1’, in front of room S1270. 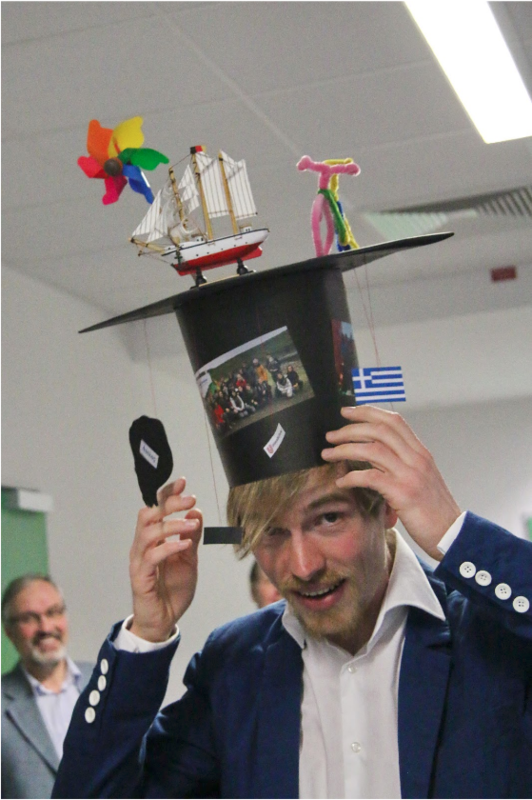 Around 40 people witness a historic metamorphosis: The first ArcTrain student is converted into an alumnus, meaning that he successfully defended his PhD thesis! The title of Georg’s presentation was ‘On the Generation of Near-Inertial Internal Gravity Waves by Wind’. In short, he investigated how wind energy is transported into the ocean. His 30-minutes talk was followed by various questions from his examining committee and the audience. Despite covering a multitude of aspects, none of the questions seemed to be a serious problem for him. My personal highlight was the audience’s spontaneous applause when he remembered the name ‘Ekman transport’ after fighting for it for two minutes. Congratulations to Georg from the blogging team, we are looking forward to the next eleven defenses!